Leading the "Reading the Doctor's Writing" trail, it's been quite a few years since I read Dr Sheila Cassidy's books Audacity to Believe and Sharing the Darkness but I was inspired so to do after hearing her speak at several study days and courses. So I was delighted when some off-blog correspondence with Philippa (who often comments here and on the Hill Blog) came up with an offer of Sheila's latest book Made For Laughter. We agreed on one of those lovely book swaps and Philippa requested On Being ill by Virginia Woolf which seemed like an appropriate exchange. Sheila Cassidy is best known as the young doctor who was imprisoned and tortured under the Pinochet regime in Chile for treating a wounded revolutionary and all this is recounted in gripping detail in this book. On her return to the UK Sheila eventually settled in Plymouth, here in the West Country, and has since spear-headed the development and continuation of the hospice and palliative care services for this area. Just how much I was quite unaware until I read this book which once opened I couldn't put down. I'm not a great lover of autobiography, always that uncertainty about whether I'm really reading a warts and all account. You instantly know this one is different. 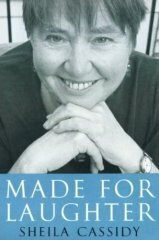 I get the feeling that Sheila Cassidy tells it exactly like it was and this book is just riven with a transparent honesty laced with genuine humility about problems,personal failings and struggles and plenty of mea culpa as she recounts her life to date. As the blurb says, this book is "a story of grace under pressure" and much that speaks from the heart and to the heart of anyone who reads it.Sheila's journey of faith is well documented and there's something quite uplifting about hearing that she has eschewed organised religion and all its trappings in favour of her own daily and constant acknowledgement of her beliefs. For many years unknowingly on the run from the post-traumatic effects of her harrowing torture in Chile, Sheila eventually had to sit down and face up to it all.It's that old millstone round the neck thing.The suitcase with contents bulging out of the sides and the traveller sitting on the lid trying desperately and to no avail to close it, eventually it becomes a pointless exercise.Suddenly the time is right and the whole lot can be taken out, washed, repaired, ironed, folded and put back in neatly. Amazingly the lid will often then shut quite easily and stay shut. "I don't remember being so well or so happy for a very long time...happy and peaceful in my heart"
this after her own recent and very ironic encounter with breast cancer. I'm pleased to report that she rates knitting amongst her relaxing occupations alongside watching The Bill and Casualty.I do hope she's turned a heel. All I can say is read this one for the story of a unique and very remarkable woman who has unstintingly left a large and very generous footprint on life for which many people, both knowingly and unknowingly, will be extremely thankful for many years to come.